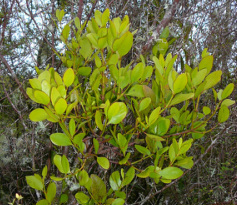 The New Zealand Epiphyte Network is equally involved with vine and mistletoe studies and each of these groups are explained below. Plants that perch on other plants. These include non-vascular (e.g. lichens and moss) and vascular (e.g. ferns, orchids and shrubs) plants. 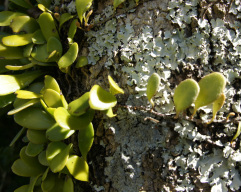 Vascular epiphytes can be classified as holo- or hemi- epiphytes. Holo-epiphytes spend their entire life in the canopy, while hemi-epiphytes spend some stage of their life rooted in soil of the forest floor. Vines are plants that root in the forest floor but cannot stand upright without structural support from other plants. Herbaceous vines are predominantly ferns that climb using roots and grow within subcanopies, disturbed areas, or forest edges. 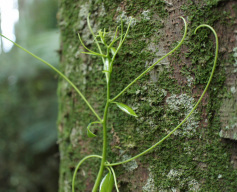 Woody vines climb using roots, stems, petioles, tendrils or hooks and are commonly referred to as lianes or lianas. Mistletoes are semi-parasitic plants (hemi-parasites) that extract resources but also produce their own energy from photosynthesis. Mistletoes have specialised roots called haustoria that penetrate the tissue of their host to extract water and nutrients.